New Boston Taxpayers' Association – Advocating for the taxpayers of New Boston. Advocating for the taxpayers of New Boston. Click here to learn more about our Chairman in a recent interview. My name is Kaleb Jacob, Chairman of the New Boston Taxpayers’ Association. I moved here with my family in August, 2007. Having lived in Bedford and Goffstown, then Wisconsin and Maine, we hand picked New Boston as our home when we came back to New Hampshire and we did not settle for any other town. At that time we felt that our taxes were pretty reasonable. Every year we saw a shocking increase. Now, I feel that property tax rates are out of control and today there are ballot items that, if voted up, will probably require more postage to get my tax bill to my mailbox. For years I have complained about these increases. On a serious note, some New Boston residents have actually cried wondering how they will afford their tax bill. Many town employees know me as the one that says “neigh” at town and school deliberative sessions. I am usually by myself, but occasionally there are others that say it and they are almost always senior citizens. This was my way to tell the town leaders that not all of us are happy with the constant hikes. For years, this didn’t seem to make any difference. When I heard about a capital expenditure that may hit our ballot in 2017 that may cost around $2.5 million and that steps have already been taken in that direction to possibly solidify the initiative, I decided to stop complaining and start a taxpayer watchdog group. And guess what? I have been extremely busy for the last week with meetings, social media, personal emails to me and back to people that you would think read my mind. My weekend of chores turned into a full time job with the NBTA and I have not been this stress free in years. It does help to talk about it and stop complaining about it. The response has been explosive in a good way. Last Wednesday, we had about 5 members on our Facebook page and today we have 56. We elected officers, board members and adopted bylaws. Our leadership team is better than what many companies have and the emails and phone calls still come in. Talking about this to residents almost always starts a vibrant conversation and most people just assumed that sharply rising taxes was the norm and that no one cared. Some have said that they never voted in town politics but that they will this year. Now there is an advocate for the taxpayer and will make sure there is constant forward motion to the goal of lowering taxes and justifying every dollar. The NBTA will be doing research, interviews and reporting back to the residents the results of their analysis. Consider becoming a member by clicking Contact Us and asking for a membership application. Here are the 2018 detailed budgets by department for New Boston. Nearly ten years ago, our family moved here because we selected New Boston as a place to raise our family. In 2007, our taxes were pretty reasonable. After all, we were moving to a rural community and did not expect a lot of services. Like everyone else, our taxes rose each year substantially. The first few years, we wondered what was going on. I understand that as communities change that more services can increase to accommodate, but it was not clear what was actually changing in New Boston. For instance, the population from the latest town report that came out last week is 5,457 (est). In 2009, it was estimated to be 5,200. The population has not been on a big rise, so what could it be? I chose to write about this take on the fire station because I attended many of the Fire Ward meetings over the last year. I accumulated quite a bit of information over that year both in public meetings, online and even from people that asked to remain anonymous. While I am pleased to see the local paper make a reappearance, I am disappointed with the front page article by Mr. Emmerling regarding a new fire station. I have read stories in this paper for years. Some may have been biased one way or the other. This article speaks for itself by interviewing only the people that have the most to gain with a new fire station. There appears to be no other side to the story which is partly the reason why I am publishing this article. I may be considered a critic, but I have done my homework. I sincerely hope that in the future we see more thorough reporting from our local Bulletin so we can weigh more than one side of the story on other subjects too. Let’s start with a short history of the plan for a new fire station. Approximately five years ago, a bond initiative was voted down to purchase ~161 acres along River Road and Byam Road for future town expansion. It was floated that it could have been the location for a future fire station, school or another town purpose. The total price was $900,000 with a bond of $800,000 according to the 2013 Town Report. In 2014, the town made another attempt at land acquisition in the form of a bond totaling $205,000 to purchase 3.25 acres next to the post office. Bonds require a 3/5 majority to pass, and at the 2015 deliberative session, one of the fire wards amended the article to take the full amount of the purchase price out of the unreserved account balance making the ballot read “with no amount to be raised by taxation.” The unreserved account balance is an account where unspent funds are placed at the end of the year, and it had around $1.3 million in it at the time. While legal, it was somewhat unprecedented and also removed the required 3/5 majority to pass rather than a simple majority. Lifting this restriction and taking it from the overflow account gave the initiative a much greater chance of passing, and it did pass. On March 6, 2016, there was a public breakfast at the fire station which is a fundraiser for the New Boston Fire Association. But this time there was a small difference. Posters were hanging in the fire station encouraging the patrons to support Article 17, which was to raise and appropriate $19,500 to obtain three pricing scenarios to renovate or build a new fire station. This had been amended at the deliberative session to include the three pricing scenarios. Originally, it was only to obtain a price for a new station. Some residents questioned it at the deliberative session, and the amendment was made and passed, but the original intent was to price out a new station. At the Fire Association meeting (a non-profit entity, separate from the town in which the fire department members belong), there was some discussion about placing the political signs there, and there was some dissent about it citing that there was no “politicking” at the fire station. The measure was voted upon and approved, so the signs went up. I would publish the minutes of that meeting, but they are not public because of the entity separation from town and the New Boston Fire Association. According to NH RSA 659-44a, that term could be called “electioneering.” Read the law for yourself. Another potential violation occurred on January 28, 2017, when signs advertising a new fire station were in the fire station training room for a public tour of the fire station. This was a larger version of a postcard that came in our mailboxes shortly after that. A pro-fire department postcard mailer went out to New Boston Residents at the end of January. I have a photo of it if anyone wants it, but since every mailbox received it, I have left it out of this presentation. Prior to us asking any questions about it, we learned the name of the print house that printed it and the customer was “New Boston Fire & Rescue.” We didn’t know if the town paid for it or if someone showed up with a hat full of donations. Several posts were put out on various social media outlets, but explanations were on the mum for this issue. If you asked a question about why we need a new station, you would get a quick response with a link to the NBFD WordPress site, or links to cancer studies which were from 3 of the US’s largest cities, and full time at that – hardly on the same level as New Boston. We even saw a professional YouTube video with a mysterious spectacle-wearing mustachioed host when a soft question was posed. Ask why it’s safe to have a public breakfast there when it’s not safe for personnel, and it was silent. 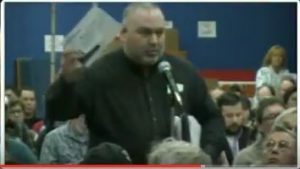 The mailer did not have the required text indicating who paid for it and no one would answer the questions asked about it, so I asked at the Town Deliberative Session. The gym was full, and no one said a word. I asked again and was met with silence until the Moderator said that it was irrelevant. The article up for discussion was the Fire Station Bond. I’m not an attorney, but since almost everyone in the room received this post card and some were likely present because they received it, I thought it was very relevant. Simply put, if you advertise, you expect it to generate a certain outcome. A reasonable person could come to the conclusion that some showed up to support the initiative at a public meeting because this arrived in their mailbox. What Did the Voters Say? The article to spend $19,500 to come up with three proposals for renovating or building a new station was defeated by a substantial margin of 633/340. However, money was spent regardless of what the voters said by ordering structural inspections of the walls and roof and a floodplain analysis to determine whether it was in a floodplain. After that, and research with the state DEP, it was determined not to be. I recognize that there are two ways to look at this. One is that they did their due diligence research and the other is that they pressed onward anyway and looked everywhere they could to show fault in the current building. Maybe the floodplain analysis was responsible. My interpretation is that the fire station is not the only building downtown, and the store, Historical Society, Town Hall and other buildings are not being relocated based on the fear of a flood. If we were worried about that, we would have to relocate the entire downtown… or the river. The last major flood did not breach the NBFD floor. Was the septic under water? Yes, but this happens to many septic systems in normal springtime melting. The location has worked since 1973, but the push is on now to disqualify it at every opportunity. I do not know how much was spent, but the voters requested that nothing be spent and by that same vote, did not want our leaders to pursue it at that time. The voters were ignored. At a fire ward meeting last summer, I asked why the building committee initiative has gone forward after the article was defeated and the response from the Fire Chief was that it was the responsible thing to do. At one of the recent station tours, where they point out all the faults of the current station and their reasons for a new station, we were told that they were asked to provide proposals for a new station, renovating the old one and razing and starting over on the same site. That sounds like the way Article 17 was written which was voted down last year. Who asked for this? Certainly not a preponderance of the voters. There was a common theme to the many fire ward meetings I attended which was that any time there was a proposal other than for a new fire station, it fell upon mostly deaf ears. There are seven fire wards, and it was not unanimous between them to build anew. Plans to renovate were quickly countered with the current challenges of space, flooding, drainage, showers, oil/water separator, gear decontamination and an exhaust ventilation system among other things. The vast majority of these items could have been addressed in the current station, but it was not seriously considered. A responsible town department would have been reacting to these concerns over the years. Did you know that the town purchased land behind the current station for future expansion? Why can’t it be used? The first objection to using it is that it was under water during the 2007 Mother’s Day flood. So, why did the town purchase it in 2015? If you put a foundation there at least as high as the current building’s foundation, it would be reasonable to assume that it would also not flood under similar circumstances since it would be the same height of the current foundation that has not flooded. I realize this appears to be beating a dead horse, but this came up many times over the last spring, summer and fall meetings as well as in some public presentations. Then came the 50% rule which never ended up in handout form to verify it. It generally meant that to renovate a building, you had to bring all of it up to code if the addition/renovation was more than 50% of the building’s value. First, it was pitched that you had to raze the building and start anew if you reached that 50% rule, but it eventually was settled that you had to bring it completely up to code if 50% valuation was reached. But in a meeting a couple of months ago, it was determined that the rule applied to a 50% of square footage rule, not valuation. Which is it? For all the careful planning of the building committee, it seems to be quite an oversight. Is a municipality required to follow this rule? And why do it all at once? Why not renovate over the course of time to keep it under 50% of whatever metric it turns out to be? Surely, there can’t be a law that says you can’t put in an exhaust system this year and an oil/water separator next year. If the building rule were true, then the land they purchased behind the existing station in 2015 could never have been utilized without razing the building. Are we getting the facts, or is it just a failure to research and plan to force only one option to the top? Wouldn’t you be sure before you bought land on which to expand? On two recent occasions, I suggested a warrant article for $100,000 to be used for renovations or whatever deemed the highest priorities for the safety of our firefighters. The last time I suggested this was at the Board of Selectman budget meeting on January 17, 2017. It could have been worded that if the fire station was passed that if the maintenance article also passed that it would be voided so that it would not be an all or nothing proposition at the expense of our first responders. At the time, it was not too late to add this article to the warrant. Perhaps the lesser amount on the ballot would have been attractive enough to the voter, that it would have hurt the chances for a new fire station. But isn’t safety the most important thing? If the new station is approved, then what becomes of the old building? As far as the majority of fire wards are concerned, they just lock the door and hand the keys over to the town hall, and the Selectmen deal with it. I don’t disagree that it works this way. Included in the $2.51 million bond is $100,000 of demolition costs to “include funds for the repurposing/demolition of the present Fire Station,” as stated on the upcoming ballot. This wording is quite misleading. To demolish and turn it into a lawn, perhaps it is accurate, but to repurpose it does not add up. If renovated, we were told that it would have a $1.8 million price tag. To repurpose may be less, but there are too many variables which clearly have not been researched. When the new library opened, the Historical Society moved into the old library. The Rec Department moved from the second floor of the town hall to the old Historical Society. Several departments moved up. When there is no formal plan for the old building, I refer to history since it often repeats itself. It has already been said that it could be a future home of the rec department, but it was not set in stone. Well, the 3.25 acres of land was advertised as a possible location for a future fire department too – and a year later, this was on the ballot in the form of exploratory funds and the year after that, it was a multi-million dollar bond. If it is repurposed for another department, it needs much of the same renovation less some fire department equipment. I think that the town is missing an important opportunity to be totally up front about this and provide a totally comprehensive plan to the voters. People crave honesty and transparency. Why not present a plan for all that is involved in this before we vote on it? Or, better yet, a fresh perspective on renovating or replacing the station. To say “repurposing/demolition” is worlds apart when we are talking about our respective checkbooks. I think this has highlighted a lack of planning as well as some exuberance for something that New Boston does not need yet. On the tour last weekend, we were told that an exhaust system might not be able to be supported by the ceiling. To me, “might not” does not mean “cannot.” I asked if it could be mounted on the wall and the answer was unknown. Our new proposed department proposal can only hold the same amount of apparatus as the old department – there are no more bays than the current one. Not that I am looking for a larger price tag, but is this short sighted? The recommendation on the warrant (and ballot) was not unanimous, which is pretty noteworthy. The vote for Selectmen and Finance Committee is 5-2. Historically, a split vote is rare. The Fire Ward vote was also not unanimous. On a board of Fire Wards where most are also members of the fire dept, how can it be an impartial board? A candidate for Fire Ward was recently countered on Facebook with an NBFD member telling him that he didn’t have any volunteering experience at NBFD. Volunteer experience at NBFD is not a prerequisite to being a Fire Ward at all, and I contend that it could blur the lines between management and the front line people. Most other boards in business would never let a board member be a front line associate because they should oversee and manage rather than hold two different interests in the same organizational structure. The appearance of a conflict of interest can carry the same weight as the real thing. Many other NH towns do not allow this arrangement that New Boston has. No Apparatus Bay exhaust system (critical for the health & safety of the department members). Why was it never employed? Will the NBFD only get a new exhaust system only if a new station is built around it? May not be able to hang exhaust system from the truss structure. May not? Did anyone check? Can it mount to a wall? No dedicated decontamination area. All contaminates flow into the floor drains and into the river. A new station still needs a tank for the contaminated liquids. This could be added at the current site. Why has it not been done years ago if it was a problem? Space is tight, but I never underestimate the skill of the right contractor and excavator operator. There are no showers and fire fighters take contaminates home and shower. Hilltop Station at the Air Force base has a shower facility. For the few major fires we have per year, why not use it? At a structure fire within a tenth of a mile of that station over a year ago, I was told that no one used the showers there. No Extractor (gear washing machine). We were told at a recent BOS meeting that we actually do have one and there was no room to put it at the current site because a bay is shared with another town dept. It currently is located at a business and it is operational. NBFD also contracts with a Hooksett company that has been reported to do a great job for us with 48hr turnaround on cleaned gear. At a Fire Ward meeting, a member of the public and Fire Ward candidate asked if we ever approached Goffstown, Bedford or Manchester for the same services and the answer was no. We save money by sending our middle and high school students to Goffstown, so why have we not even looked into this to save costs? No Hot/Cold zone (contaminated vs non-contaminated areas of the station). Is there no way to do this here by expanding back? The wooden structure of the building has been out of code since 1973. Many voters are having a hard time with this statement. Built in 1973 and non-compliant. Who is to say that in 20 years, the story won’t be the same as it is today. Blame someone or some company that is long gone. Five floor drains flow to the river (EPA violation). Fix it with an oil/water separator, which we should have anyway. See #3. Emergency Sprinkler water supply is inadequate. It was installed 10 years ago! Sounds like the 1973 construction statement. First, it’s 1973 that we didn’t build something to code, now code compliance from 2007 was not followed? Emergency Sprinkler pump is too small. See #9. No excuses. The three Apparatus bay doors are too small for standard sized vehicles (10’x11’ vs 14’x14’). If you put in just one 14’ door, the next two fire trucks will fit in there if they are not ordered special. Just put in a taller door. It’s cheaper than a shorter retrofitted truck. Pipes can be moved. There is no well onsite, water comes from Town Hall. Has this been a problem? Would the new station need a new well? Primary support triple beam in the back bay is too small per structural code. Replace/reinforce it. I saw the video and I have seen it on the tour. It looks pretty easy to do. Buildings electrical systems are violating the electrical code. Aren’t municipalities exempt on some items of existing structures? If it’s a safety issue, then fix it. Why did it go on so long? A code correcting renovation would exceed 50% of buildings square footage thereby requiring 100% of the building being brought up to meet all current day codes. Even if you take a yearly stepped approach? Note: Up until January, the Fire Wards were operating on false information that it was 50% of valuation. Decisions were made on this. The emphasis up until then was that renovation costs would overrun the 50% valuation. Adding a training room on the back with showers where they already bought land would turn the upstairs into needed storage and still be far under 50% square footage. We are working on a plan to move the PPE out of the apparatus bay. Potentially resolved. The kitchen is adjacent to the apparatus bays which violates the needed separation between contaminated and non-contaminated spaces. Expand and move it back. Why was it ever put there in the first place? Regardless of code, this should have been common sense. Also, there is a second full kitchen upstairs that is nowhere near the bay. EMS supplies are stored in the apparatus bay with diesel exhaust present. See #17 & #18. The septic system is 44 yrs. Old. Does it work? Is it actually a problem? Shared w/ church for many years. And it probably will continue if another entity occupies it. Floods over. As do so many others in down, others more often. 2007 was the last time? Cannot accept contaminated water from showers or extractor. See #8 & #4. Cellar floods, there are orange watermarks (iron) at the level of the furnace burner. Raise the furnace. It has been raised before, seeing that it is on cinder blocks. Or, raise the outside bulkhead door. Neither stairway has a 1 hr. fire rating. Are we just talking about a ½” drywall overlay? Neither stairway exits directly to the outside. Move the door over a few feet. Electrical panels on wall of back stairway. Can it be moved, covered, etc? Training / Meeting room is too small – Members stand for 1-2 hours during trainings & meetings. Small, but it does work now. Can you use the library, school or second floor of the town hall? Or, use the land behind the station to expand a training room and more? Two small offices are shared by officers, firefighters and EMS personnel. I have never personally seen anyone sitting at one of the desks as many times as I have been in there. Does sharing the office(s) work? Offices for all listed sounds like a lot of unused space. Space between apparatus is inadequate. Having been in this station many times, I completely disagree with this. In the NBFD video, the biggest thing in the way of the EMS personnel was the distinguished looking host. Insufficient storage space. At the risk of being redundant, expand back, and the current training room becomes storage. Elevator not required for storage. No 1 hr. fire rating between back bay ceiling and floor of the training room. (Fire code violation) Will drywall or a suspended ceiling fix it? Limited parking in center of town which will get worse with time. Parking is not great, but what else is moving in to make it worse in time? Current station is impossible to expand if it’s required in the future. Why did we buy land to expand to in 2015? One item that also came up a lot was whether public breakfasts were safe for residents. When asked this question at the last open house on March 4, this was finally answered along with an explanation about cancer. The condensed version was that there is elevated cancer in Fire Department personnel and studies across the United States have only “taken stabs at it” but there is no definitive reason for the elevated numbers. Through research on the part of the NBFD, they have taken many precautions to keep foodservice safe for breakfasts, and there is a story on their WordPress site about it that was posted on March 3, 2017. I am not suggesting that we will never need another fire station, but I have reached the conclusion that it would benefit the taxpayers if we had a fresh perspective on the proposal. One way to head in that direction is to elect a qualified person to the post of Fire Ward. There are two positions open, and two of the three candidates currently hold the position and are running for re-election. They are good people dedicated to the NBFD, but if re-elected, I don’t think we can expect any other position out of this board. I am voting for Denis Pinard because I trust that he will approach any issue with safety in mind as well as maintaining or growing with our town based on needs over wants. He has 27 years of experience in firefighting and currently serves as a Lieutenant at the Manchester Fire Department. One thing that he said that he would like to see first is that Fire Ward minutes be published online like many other Town departments currently do. Another initiative would be to have a roster of Fire Wards on the NBFD website along with an explanation of a Fire Ward’s role and responsibilities. I encourage you to vote for Denis, and only him even though you can vote for up to two in order to increase his chances of securing this office. If we do not make changes, then we should not expect any. Get involved. Attend department meetings and ask questions. New Boston is a small town, but it is actually the largest business here and it has many moving parts. A good place to start is at www.newbostonnh.gov and click on the calendar to the right to see what is coming up. There are opportunities for public input, and usually a handout to take with you. If you think things can be better, let our leaders know that. Ask questions. For the most part, I have had prompt and courteous responses whenever I ask questions, and I ask a lot of them. Consider joining the NBTA where your dues and efforts can further the cause of being an advocate for the taxpayer here. New Boston is not someone else’s town, it’s your town. Over the last few months, there has been some information floating around about our town’s detailed budget. Here is a link to such a detailed budget on the Town of New Boston’s website. http://www.newbostonnh.gov/Pages/NewBostonNH_BBoard/058E3F2A-000F8513. Take a quick look for yourself. It’s 11 pages long, but there is another set of detailed budgets that are this long for just one department. Members of New Boston Taxpayers’ Association Board reviewed the detailed budget numbers for this year, last year and this year’s default budget, a few weeks ago on a particularly snowy Sunday afternoon. We obtained a substantial stack of paper that was closer to 100 pages which provided far more detail in them than posted on the town website. We examined this because, compared to last year, we noticed that the difference between the default budget and the proposed budget for the school and town were much closer to the proposed budget than it was last year. Not to speculate too much, but since budgets have rarely every been voted down (invoking a default budget), it seemed plausible that the default budget presented this year was crafted to be a bit more advantageous for the town departments, should the proposed budgets be voted down again. Because of this, we looked for one-time expenditures that could be removed from the default budget compared to last year’s budget and we found a significant amount that we presented to the Town Administrator, Peter Flynn, and Selectman Rodney Town. I’d like to thank them for making the time on short notice to accommodate that meeting. One point that was put out over the last year was that town employees had to forego a raise that was scheduled for them last year because of the default budget. This is not to be confused with contractual agreements for other raises. One example is that the school teacher collective bargaining agreement was in place and raises were given according to the 3-year contract voted in last year. The last time the lack of raise was officially brought up was at our NBTA meeting where Bill Gould (Library Trustee, Town Treasurer and Chairman of the Finance Committee) showed up at our meeting uninvited and told our membership that no one working for the town got raises, but that everyone else in town did get raises. He was referring to the non-town employee residents. The latter comment was met with some laughter. In looking into the detailed budgets, we found that raises were quite prevalent in the budgets. This was confirmed during the meeting with Flynn and Towne. As was explained to me, the Dept. of Revenue Administration (DRA) has guidelines on default budgets, which New Boston was under last year. Rather than keeping line items, or even departments under the default budget amount from the prior year, the bottom line is the only number that matters. So, they found ways to adjust some expenditures throughout the summer to accommodate giving the raises later than expected. They were originally scheduled for April 1, 2016, but were given on September 1, 2016, instead. Better late than never, but given nonetheless. I am putting this out there because there was a fair amount of negative press about the voters handing the town and school a default budget last year. The town had a $135,000 surplus and the school is expected to have a surplus as well come June 30 this year. In the end, each item that we found that could have lowered the default budget was affirmed by Flynn and Towne to be allowed. There is a lot of information here – each department is a separate link. This is where your tax dollars are going. You be the judge whether it is being used wisely or not. These documents show detailed expenditures and salaries from last year to what are proposed for the upcoming election.